CZ has always had a great reputation among shooters, and the new P-09 deserves every bit of your attention. 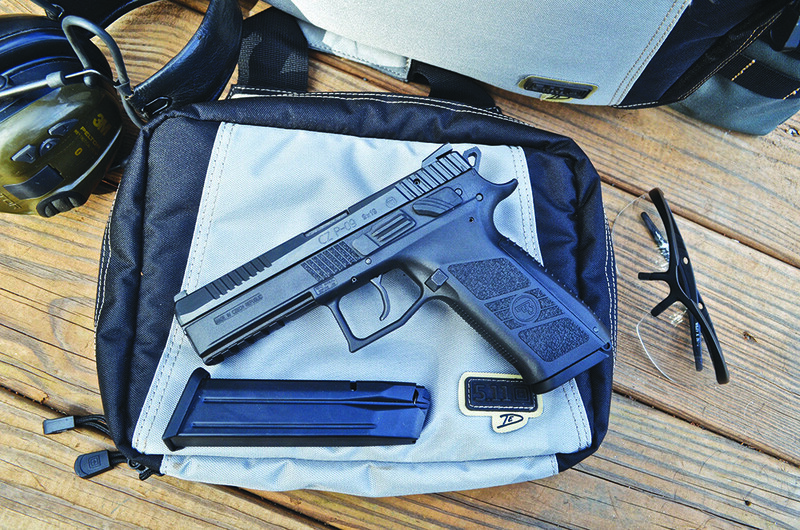 The new polymer-framed pistol is the latest in a long line of reliable pistols, and I found it to be one of the most accurate handguns I’ve shot in a while. five-slot picatinny rail on the underside of the muzzle, and a smooth, traditional, double-action trigger. It is also available with tritium night sights and even a threaded barrel, but our test model had only the glow-in-the-dark sights, which held a flashlight charge pretty well. CZs look a tad different from other manufacturers in that the slides ride inside the rail of the frame as opposed to the outside. Some shooters might not prefer the lower profile of the slide, but it’s said it gives the pistol a tighter lockup that in turn allows greater accuracy. My experience with this pistol has my agreement because it was extremely accurate. Somehow I found myself at 100 yards shooting eight-inch steel plates with this pistol. I know some readers might think I’m exaggerating, so I grabbed my video camera and posted the proof on YouTube. You could check it out yourself. I can’t say that I’ve ever had a pistol shoot that well for me right out of the box, and I’m still quite impressed. Another perk was the lighter trigger. 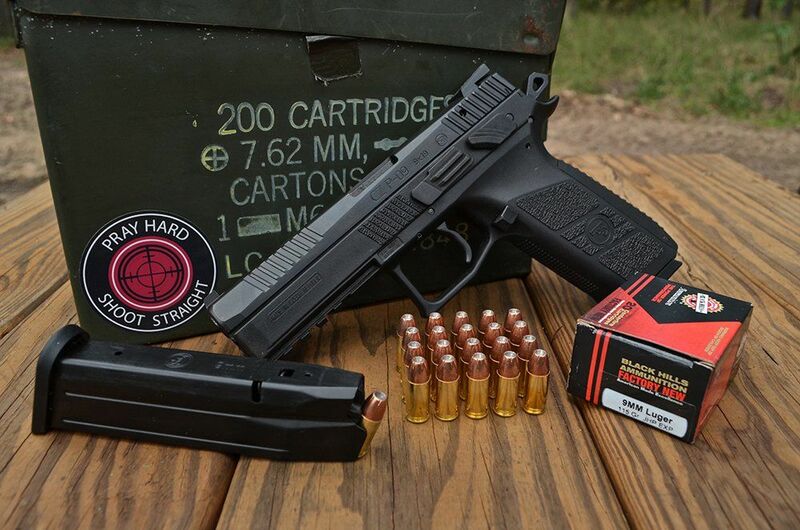 Most stock pistols come with a heavy, gritty trigger weighing anywhere from five to seven pounds. 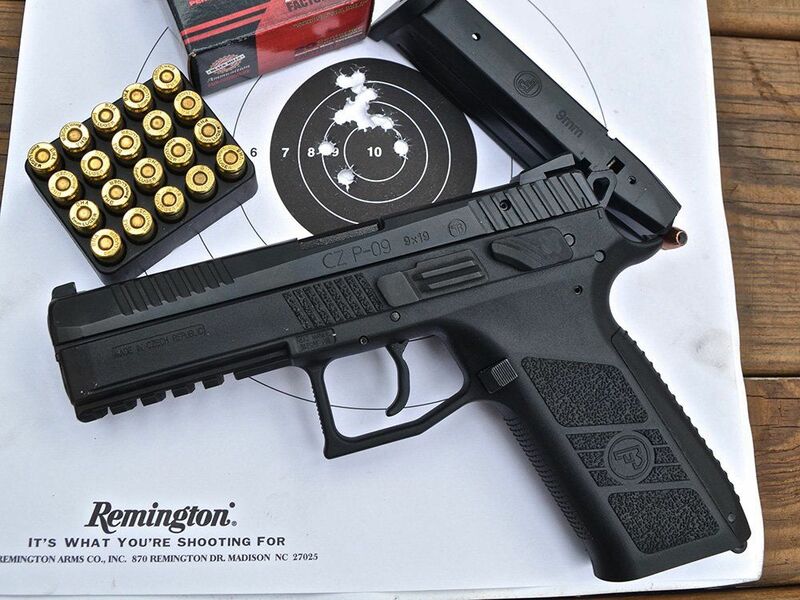 The CZ P-09 breaks at a crisp 3.5 pounds in single action mode. That’s competition grade to me. The double action was a smooth eight pounds, not bad at all when I’ve had other guns come in at 10 to12. The pistol’s controls are convertible to cater to any shooter’s preference. It comes with a decocker installed because most shooters prefer to carry in double action mode as opposed to “cocked and locked.” But if you want to go single action style in a few minutes you can exchange the decocker out for the included safety selector switch. I did this myself in less than 10 minutes by following the owner’s manual. Then I swapped it back again in under three. The full size P-09 carries an impressive 19 rounds of 9mm that puts it in the highest of its class. With this plentiful capacity, great trigger and excellent accuracy, not only would it be a dependable defensive sidearm, but I would feel plenty comfortable wielding it in any IDPA or three-gun competition. The P09 retails at a surprisingly low $530 for the standard model and $596 for the Flat Dark Earth finish or $577 for the suppressor-ready model. And yes, it is also available in .40 S&W. This pistol is definitely worth a look next time you see one in the local gun shop, or if it’s too large for your taste check out the P07 for a more compact package.